Bhutan’s media policy attempts to foster a free and responsible media that acts as a government watchdog and cultivates Bhutanese culture that is appropriate for a Gross National Happiness (GNH) society. This chapter explores the implementation of media policy, demonstrating that there is significant conflict among governance actors as they attempt to imprint their interests onto the process. The central ministry tends to dominate this situation although this is not always the case. The GNH policy implementation tools play no meaningful role in shaping the interests of governance actors and these actors maintain competing understandings of GNH. Nonetheless, policy outcomes generally reflect original GNH intentions as common cultural values constrain conflict to operational issues. Arora, V. (2012, August 24). Bhutan’s fourth estate in bad shape. Asia Times. www.atimes.com. Accessed Aug 26 2016. Bhutan Broadcasting Service. (2012, August 20) Government defends its stand on advertisement controversy. Bhutan Broadcasting Service. http://www.bbs.bt. Accessed Apr 26 2017. Centre for Bhutan Studies. (2011). 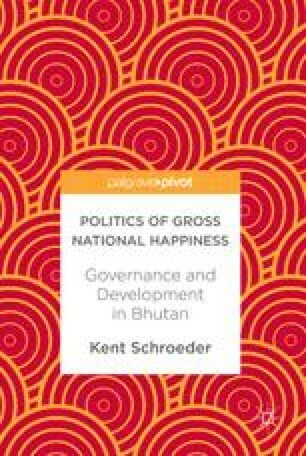 Results of the second nationwide 2010 survey on Gross National Happiness. Centre for Bhutan Studies. http://www.grossnationalhappiness.com. Accessed Feb 16 2017. Dema, S. (2010, November 29). The ambiguous state of the fourth estate. The Journalist. http://www.ipajournal.com/2010/12/06/the-ambiguous-state-of-the-fourth-estate/. Accessed Apr 26 2017. Dorji, M. (2012, June 2). Advertisement policy presented to Committee of Secretaries. The Bhutanese. http://www.thebhutanese.bt. Accessed Apr 25 2017. Dupchu, C. (2016, January 29). Audit points out grim reality of newspapers’ circulation. Bhutan Broadcasting Service. http://www.bbs.bt. Accessed Apr 23 2017. Freedom House (2002). Bhutan: Freedom of the press 2002. Freedom House. http://www.freedomhouse.org. Accessed on Feb 18 2017. Freedom House (2015). Bhutan: Freedom of the press 2015. Freedom House. https://freedomhouse.org. Accessed on Feb 18 2017.